Prosecutors allege that Luzerne County Judge Mark Ciavarella, left, and a second jurist, Michael Conahan, took $2.6 million in kickbacks in return for guaranteeing the placement of juvenile offenders into youth lockups run by PA Child Care LLC and a sister company, Western PA Child Care LLC. The Pennsylvania Supreme Court ruled late Thursday that almost all juvenile delinquency cases heard by an indicted former judge must be thrown out. The ruling means cases heard by former Luzerne County Judge Mark Ciavarella from Jan. 1, 2003 to May 31, 2008 are in question for fairness and impartiality. The decision could impact up to 6,500 Pennsylvania youth, whose juvenile detention records will now be erased and their cases dismissed without the possibility of retrial. Most of the affected youth have already served their time. In Pennsylvania, juvenile criminal records are not automatically expunged when children turn 18, so Thursday's ruling could give thousands of kids a clean slate, said Marsha Levick, deputy director of the Juvenile Law Center in Philadelphia and an attorney for the children. About 100 Pennsylvania children could now be released from juvenile detention or taken off of probation, according to Levick. "The court's far-reaching order is an exceptional response to the most serious judicial scandal in the history of the United States," Levick told ABC News. The ruling is the latest stunning development in a story of corruption that first shocked Luzerne County residents in January 2009. Federal prosecutors announced that respected county judges Ciavarella and Michael Conahan had pleaded guilty to tax evasion and honest services fraud. However, their plea deal and relatively light sentence were later rejected by a federal judge who ruled that Ciavarella and Conahan had failed to accept responsibility for their crimes. In fact, Ciavarella had previously told "20/20" that "we would never agree that [the kids' sentencing] was improper." Now, the two former judges face much more serious federal racketeering, bribery, and extortion charges. All of this is the result of a lengthy investigation by the Internal Revenue Service and the FBI. Ciavarella and Conahan have pleaded not guilty. "They sold their oath of offices to the highest bidders and engaged in ongoing schemes to defraud the public of honest services that were expected from them," Deron Roberts, chief of the FBI's Scranton office, said at a late January news conference announcing the case. The judges' arrests shed light on a mystery in Luzerne County: Why were so many kids getting sent directly to juvenile detention after seeing Ciavarella in his Wilkes-Barre juvenile court? And why were those kids sent away in such a rush? "I was 12 years old when I got locked up. I had no clue what to say when he asked me how do I plead," Stefanski told "20/20" correspondent Jim Avila. His offense? He went joyriding with his mom's car and ran over a barrier, smashing the undercarriage. No one was hurt, not even Stefanski, but in order to get her insurance to pay for the damage, his mom, Linda Donovan, had to file a police report. Donovan even thought an appearance before a judge would be good for her son and give him a little scare. She wasn't prepared for what happened when Eric came before Ciavarella. "He read me my charges and said, 'How do you plead?' And I didn't know what to say, so I looked at my mom, and I guess she didn't know I was looking, and I said, 'Guilty,'" Stefanski said. Stefanski was locked up for two years. He was not represented by an attorney, his mom said, because she didn't think he needed one. And she had the evidence to back it up, she claimed. Levick said kids were being locked up for minor infractions. "A child who shoplifted a $4 bottle of nutmeg," she said. "A child who was charged with conspiracy to shoplift because he was present when his friend was shoplifting. A child who put up a MySpace page, taunting her school administrator. 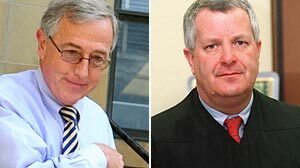 Ciavarella and Conahan had allegedly devised a plot to use their positions as judges to pad their pockets. They shut down the old county-run juvenile detention center by first refusing to send kids there and, then, by cutting off funds, choking it out of existence. They then replaced the facility with a cash cow -- a privately owned lockup built by the judges' cronies -- and forged a deal for the county to pay $58 million for a 10-year period for its use. At the time, Conahan was serving as president judge of the Luzerne County Common Pleas Court, a position that allowed him to control the county-court budget. Ciavarella was the Luzerne County juvenile court judge. In the judges' original plea deal, they admitted that they took more than $2.6 million in payoffs from the private youth detention center between 2003 and 2006. "The information alleges that the judges ordered juveniles into these detention facilities, the facilities in which they had a financial interest, and on occasion that those orders were done, despite the recommendation of juvenile probation officers that the child not be detained, not be imprisoned," Carlson said. Ciavarella denies having sentenced kids for cash, and told ABC News last spring, "I'm not pleading guilty to anything relative to cash for kids, embezzlement, extortion, quid pro quo. Absolutely not." Dave Janoski, projects editor of the Citizens Voice newspaper of Wilkes-Barre, said, "You could see that, at the very moment, when they could make the most money, that's when the number of kids spiked." Many Wilkes-Barre residents exploded with anger when they heard that men they elected, and trusted to judge their children, had profited from their incarceration. "I think that we had a conspiracy of silence going on in Luzerne County," Levick said. "There were officers of the court, there were members of the district attorney's office, members of probation, private lawyers, public defenders, who were in the courtroom every day. And they had to know what was happening and whether it was by virtue of intimidation or an unwillingness to get involved. The fact remains that nobody stood up." When Ciavarella was asked about families' complaints of his rapid-fire brand of justice and trials that lasted only minutes with even first-time offenders sent to detention centers, he told "20/20," "You take a look at their file and you look to see if this was the first time they had a run-in with the law. It might have been the first time they're in front of me. You may be surprised that it's not going to be as clear-cut as they would like you to think." "I'm seeing cases which seem to take in the neighborhood of a minute-and-a-half to three minutes. ... That simply is not the way to do business." Chief Justice Ronald Castille of the Pennsylvania Supreme Court told ABC News last spring that "the Supreme Court is committed to righting whatever wrong was perpetrated on Luzerne's juveniles and their families." Thursday, he delivered on that promise. CLICK HERE for more "20/20" reports.